A cash balance plan is a type of defined benefit that looks similar to a defined contribution plan (such as a 401(k)) in that participants have individual accounts that are credited with contributions and earnings each year. While cash balance plans appear similar to 401(k)s on the surface, they are defined benefit plans because the benefit is defined by the plan document (as opposed to being dependent on asset performance) and the investment risk is with the employer. 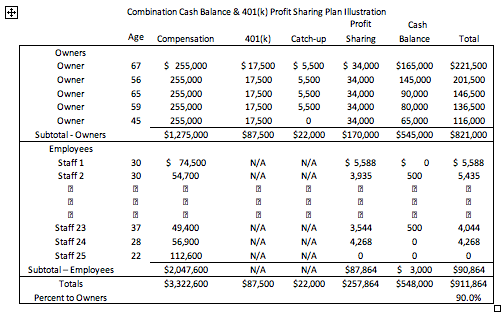 Contributions can be significantly higher than 401(k) plans (see table below). The benefit is expressed as a lump sum so is easier to understand and communicate. Benefits can be equalized among participants because they need not be based on age. Liabilities are generally more predictable. Employer contributions approximate increase in liabilities each year. “Hypothetical” accounts are established and maintained for each participant in a cash balance plan. The accounts are hypothetical because assets are pooled in cash balance plans, not divided into individual accounts. In order to produce employer contributions that approximate the increase in liabilities each year (i.e. participant contribution credits), an earnings credit is typically selected that mirrors rates of interest prescribed by IRS for calculating employer contributions, typically in the range of 4 to 5.5%. How Are Employer Contributions Determined? Like all defined benefit plans, employer contributions to cash balance plans are determined by an actuary and consist of two parts: (1) the current year’s contribution credits plus and (2) an adjustment to take into consideration past differences in asset performance as compared to earnings credits. That is, the plan’s actuary calculates the contribution by, in part, comparing the value of accounts (using actuarial assumptions and methods, including interest rates prescribed by IRS), to the market value of plan assets. This is what results in the investment risk being with the employer. For example, if the investment return falls short of the earnings rate, the employer contribution may increase for that year. Conversely, if asset returns exceed the earnings rate the annual employer contribution may be reduced. For this reason, it is not only important to select an earnings credit that approximates prescribed rates, it is also important to structure the plan’s investment portfolio in a manner that provides returns similar to the plan’s earnings credit on an annual and ongoing basis. This generally leads to a conservative investment approach in order to maintain the value of plan assets as close as possible to the value of participant accounts. To help compensate for the relatively conservative earnings, participants may desire to consider investing any 401(k) accounts more aggressively. Contributions in excess of $51,000 annually desired for individual participants. Businesses already making contributions to retirement plans (profit-sharing or match). Professional practices or businesses with multiple owners. Notes: Owner cash balance contributions are determined at initial plan setup and can vary individually based on affordability and need. A minimum number of participants are required to participate in cash balance plans. Reasonable business classifications must be used to determine who is covered. The profit-sharing contribution is 7.5% of pay for covered employees and the maximum permitted by law for owners. To avoid discrimination, like all qualified retirement plans, cash balance plans must satisfy a variety of tests in order to meet IRS requirements. The amount of benefits provided by the plan must be tested as well as the number of employees covered by the plan. Both tests compare highly compensated (5% owners and those earning more than $115,000 annually) to non-highly compensated employees. A common goal of employers who sponsor retirement plans is to manage staff costs while maximizing benefits for key contributors/owners and executives. However, sometimes the cost required for employees makes the plan unattractive. Non-highly compensated employees as long as IRS nondiscrimination tests are met. Creative plan design techniques increase the attractiveness of cash balance plans by enabling the plan to meet each employer’s unique needs and objectives. The actuaries and consultants at First Allied Retirement Services are experienced experts in the design, implementation and administration of cash balance plans. Working as a team with qualified financial advisors, our clients can rest assured that their cash balance plan is designed to be tax efficient, cost-effective and meet all compliance requirements providing employers with satisfaction and peace of mind.